My baby is too old for Baby Yoga & Play but not walking yet, is there a class? Yes! That’s Tot Yoga, which is for crawlers (or near crawlers) and walkers up to 24 months. Which class should I start with for my 21 month old who’s never taken yoga before? Probably Toddler Family Yoga, but get in touch if you think the slower, slightly less boisterous environment of Tot Yoga might be a better fit. Learn more about Early Childhood Yoga classes. My child is shy. Is that ok? Absolutely. It sometimes takes a few weeks for our more reserved students to get comfortable enough to participate. That’s one of the reasons we offer classes in 6-10 week series rather than drop-in. Toddlers especially need time to get used to a space, a group of people and an instructor. Even once they are comfortable, some more reserved little ones may be more watchers than doers in class. That doesn’t mean they are not learning and they may be more inclined to practice at home. Do parents participate in early childhood or family yoga? Will I get a workout? We do expect parent participation. The more yoga you do in class the more your child will do. While parents should expect to move quite a lot, we will be doing yoga appropriate for the child’s age range, so it’s probably not a workout for the grownups as compared to an adult class. Is early childhood or family yoga safe for me if I’m pregnant/have special conditions? Poses and activities are designed with toddlers/preschoolers in mind. While your instructor will likely be able to make suggestions, we expect adults to take care of their own bodies during class. It’s rarely a problem. Pregnant moms often skip or modify belly-down poses and anything else that doesn’t feel right and adults with special conditions adjusting accordingly. The biggest challenge is probably for adults who have significant difficulty getting up and down from the floor. I’ve had mobility-challenged caregivers, usually older nannies or grandparents, do very few of the poses with no problem. My suggestion is to try it and see how it goes. Do note that several of our class venues are down a flight of stairs (strollers can be left locked outside). Our Saturday and Sunday class venues are handicap accessible. Can one adult bring twins to early childhood classes? Will this work for my nanny-share? 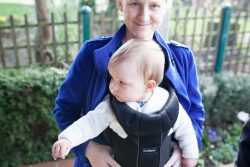 Baby Yoga & Play – Yes, you can bring twins. Because so much of this class hands on we charge the same for two babies as one baby if there’s only one caregiver attending. No need to register both babies, simply put them both in your account profile, sign one up, and join us. If you are bringing two adults, you must register both children. Sibling discounts will apply. Tot Yoga – Yes, twins, siblings. and nanny-shares are welcome, however all children between crawling-24 months must be registered and all children present must have accounts in the system. No need to register non-mobile younger siblings or share partners. They are welcome to tag along with parent/caregiver, just note them on the registration form (and have their parents create an account for them if they are not attending with a paying sibling). Sibling discounts automatically apply.See below for nanny-share discount. 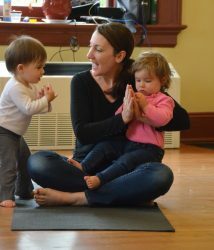 Little Family Yoga or Toddler Family Yoga– Again, twins, younger siblings, and nanny-shares are welcome. This is the age range we most often see younger siblings. All children older than 1 year must register for class. No need to register non-mobile younger siblings or share partners. They are welcome to tag along with parent/caregiver, just note them on the registration form (and have their parents create an account for them if they are not attending with a paying sibling). Sibling discounts automatically apply.See below for nanny-share discount. Family Yoga – Siblings up to one year younger or older than the target age range are welcome to register for Family Yoga classes. For example, 3-year-olds are welcome in classes with the stated range of 4-8 yrs. If you have any questions about the appropriateness of class for your child, please contact us. Sibling discounts are automatic. Please contact us with any additional questions or to discuss situations that don’t fit the above scenarios. All children must be added to their own parent’s account in our registration system to attend class. Please do not add an unrelated nanny-share child to your profile. Their parents must set up an account and accept our terms & conditions. If a nanny-share misses a class, the whole share is welcome to make up class on an alternate day or parents of the enrolled students my bring the child to do a makeup on the weekend, with or without their share partner. 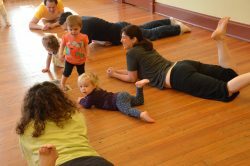 Tot, Toddler or Little Family Yoga – Families registering as part of a nanny share (one caregiver bringing multiple unrelated children) are are eligible for a 10% discount with the code NANNYSHARE10. Discounts must be taken during registration and cannot be applied retroactively. 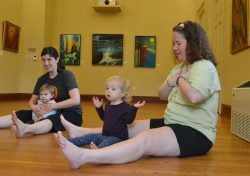 Baby & Me Yoga – Because so much of this class hands on we charge the same for two babies as one baby if there’s only one caregiver attending. However both families in a Nanny Share registration must create accounts and be reachable in case of emergency, so both families can use the discount code NANNYSHARE50 to take half off registration.